Chicken potpie was one of the very few things I ate growing up that came from a box in the freezer. That and a Mexican food TV dinner were the tastes of my parents going out and leaving us with a babysitter. I have some fond memories of those tastes. These days you can even buy really decent yummy organic chicken potpies from a box in the freezer, but they are single-serving size and just don’t feel substantial enough to make a real meal. And of course, chicken potpie is all about the crust. The Pennsylvania Dutch call a soup with square homemade noodles chicken potpie, but try serving that to friends and family and getting away with it. (Trust me, I tried it once.) It’s good, mind you. But it’s not the same as a good crust. Real crust. It’s all about the crust. Mix the dry ingredients together and cut in the butter and lard. I use my fingers to pinch everything to tiny bits (gently and patiently; takes about 4 minutes). Add the cold water and mix everything together. If it still feels too dry and floury, add a dash of olive oil to make everything stay in a ball shape. Put in the fridge while you make the rest of the stuff. In a saucepan, melt the butter, add the flour, and stir until the mixture bubbles. Add the broth and cut-up chicken and stir until it’s all boiling (the flour-butter mixture should make the broth thicken). No need to overcook this part, since it will all cook together in the oven! Divide the dough into two balls and roll out the dough on a clean, floured surface. Put the bottom layer of dough in the pie pan then add the hot potpie filling mixture. Roll the top out and carefully place it over the filling, crimping the edges together. I used a fork to poke a star shape in the top. Nothing fancy—it’s just going to get eaten! Bake for about 45 minutes, or until the crust looks…crusty! You will probably have extra dough. This is the fun part! You can just salt it a bit and cook it to make a yum little snack, or make a tiny little pie just for fun. Add sugar to make it sweet or jam to make it jammy. The options are endless. That dough will not go to waste! 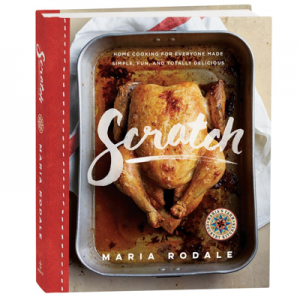 Maria, this sounds yummy and is a favorite of my husband and mother-in-law. 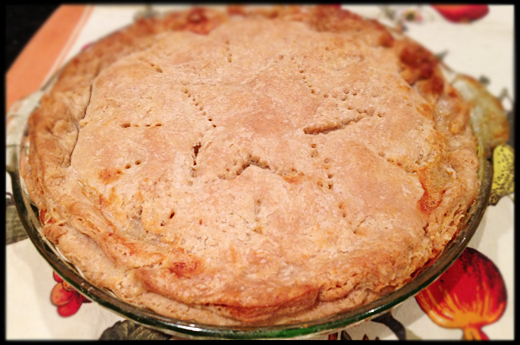 One question, though…I was taught the French way…all butter crust…is there an advantage to the half butter half lard? Isn’t lard something like rendered bacon fat or is it ‘Crisco’? Thanks! Am bookmarking this page and making this soon! You can do all butter, but lard gives it a distinctly “meaty” taste. Lard is rendered pig fat. It’s gross. But get it from a good organic/toxin free source and it makes things totally yum. In moderation, of course. This is something that we lived off of also, during childhood. They were really tasty then. I doubt if they taste anything similar to what we got as children. We always ate 2, one chicken and one beef. Delicious they were, and filling. My grandmother always baked them until the crust was medium brown and crisp! Yum! Maria, you are correct. The best thing about the pot pie is the crust! Without that, it’s just another soggy meat pie. You know, I ate my first pot pie a couple of weeks ago (at age 45…where was it all my life!) and it was store-bought. I’ve wanted to make it myself ever since. Thanks for the recipe! I’m definitely going to make this … ahhh comfort food that makes you feel like a kid at grandma’s table again! Thank you! I bought a chicken pot pie from Trader Joe’s a month ago and, honestly, it was inedible. Threw half of it away and I hate wasting food. I’m going to try your recipe over the holidays. Thanks. Not a fan of lard. What can I use as a substitution? I’ll put this in the file, I need a good crust, always looking. But I do have a quart jar of the pickled cabbage in the fridge and one in the freezer…good stuff!! So glad to have this recipe, but while I’m here I’d like to say a word on behalf of the much-maligned lard. I think many people equate it with the idea that it’s just plain fat. And yes, it is, but that’s the idea. It’s PLAIN fat. Not a bunch of highly processed goop with all the good stuff leached out and the bad stuff added. Many cultures that still rely on it for cooking are basically much healthier that we more “modern” cultures who over process everything. And it’s true, it does add a flavor. If you fry a corn tortilla in lard you will never want one fried in anything else. Well, you might, but I’ll bet that just about anything else you might choose would be worse for you. It is important, though, as Maria says, to get the organic lard because so many pesticides, etc. gather in the fat. 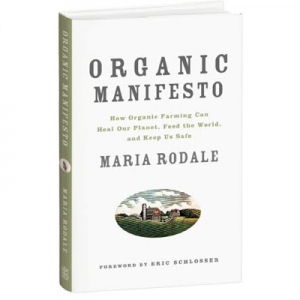 Thanks, Maria and the Rodale family, for all you do for us. Forgot something …. A word on behalf of potpies cooked in a pot. I grew up on beef potpie and homemade noodles … my Pennsylvania Dutch mother called them dumplings. It was beef, potatoes and dumplings … and lots of tasty broth which we topped with chopped onions. When I make it today I add peas or beans, chopped carrots and sometimes celery and plenty of parsley. It’s a great meal for a cold night. Hi I’m from South Africa and the pie sounds awesome- however we don’t refer to butter-per stick! How much is that in grams or oz? Thanks a mil! 1 stick = 4 ounces or 113 grams. My Pa Dutch pot pie had little bow shaped noodles. My great grandmother made them from scratch. Seriously Lard???? Most health conscious foodies have found way to make amazing crusts without cardiac arrest coating of lard–very disappointing! You can use all oil or 1/2 butter and 1/2 olive oil or pop the taste with walnut oil. Tip refrigerate the oil until it’s firm and be sure to let the dough rest for about 20-30 min. in frig then leave it out 5-10 mins before you roll it. If you’re too rushed sometimes to make it yourself, try the Whole Foods Market version. I recently tasted the ones made in Atlanta (for the southeastern U.S. stores, I guess) and the crust was delicious. A pleasant surprise. Just tried the recipe and crust was amazing,even though i’m not a fan of lard it was very good. The insides on the other hand weren’t so great. I think something more like a rich gravy would do the trick. I’ve never made a pie crust that turned out the way it was supposed to – that rolled out smoothly, was pliable, etc. Everything in this recipe went together beautifully and your measurements were spot-on. I can’t wait for it to come out of the oven. Thank you for teaching me how to finally make a proper pie crust! Just a side note: Do you think that perhaps using organic butter yielded a better crust result? I think maybe the butterfat content is higher? Or I could be totally wrong! Thanks!